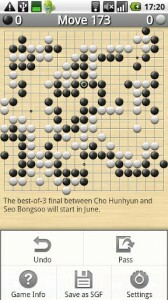 It has been a while since the E-J reviewed go programs available on the Android platform, and given that not all of us have iPhones, I thought it was time to do an update. I should note first that I love Apple, and have three Apple computers in my home. However, I hate the iPhone and iPod touch for go. Why? One simple reason: the screens are so tiny it makes me go cross-eyed; as for the iPad, it is too big to fit in my pocket. I have had several Android devices, and my current one is a Samsung Galaxy player with a 5″ screen. It is small enough to carry easily, but big enough to see what I am doing. Another advantage Android offers is that it is open-source, which means people can develop and change apps very quickly. On the whole, I have found Android developers incredibly responsive, and three programmers actually changed their application based on user comments, in some cases overnight! I also have no need for a cell phone contract, or expensive data plans, what I wanted was a wireless only device, and I got mine specifically to record go games. There are a ton of apps out there, so I thought letting our readers know which ones I found most helpful would be useful. A tip for searching, don’t bother with “go”, search for “baduk” or “weiqi” on the Google Play Store. I will review three game recording apps this week, and then review apps for Go Problems next week. I am not reviewing KGS for Android as it requires a data connection, so I can’t use it to record games if I don’t have internet access. People who play on KGS, and want to do so on their phone, or watch games, will love the app though – it is beautiful and functions very well. Gobandroid is a fully featured game recording program that comes in two versions, Tiny and HD. Both come with a ghastly pale default skin that makes the board and the stones look unappealing, the black lines are highlighted to boot, which makes it hard to tell what is going on. Download the free Sente skinstaller from the market though, and you can make the program look beautiful. The great merit of Gobandroid Tiny is that you click on the board, and it zooms in to the area you are looking at. From there, you can choose where your stone goes precisely, and then it zooms back out to the full board. This means you have to click twice to place a stone, but it makes it easy to see what is going on. Gobandroid HD has an awkward interface that enlarges part of the screen and keeps the full board visible as well. Although this feature is well developed in other programs, in HD it is just confusing visually. Gobandroid Tiny is my version of choice. I often find that I have mis-recorded a stone while playing. No problem if it was a few moves back, but what if it was 50 moves back? With Tiny, just rewind to that spot and click on the stone. It will turn transparent. Then click where you want it to be, confirm it, and you can then fast forward to where you are in the game, with all other moves intact! It is worth noting that this program did not come with this feature at first. But a reader posted about it on Life in 19×19, and the developers added the feature. You can also load games and problems from online sources, through helpful links in the program itself, and can install the gnugo AI if you want to play against a computer. Don’t expect a strong engine obviously, but it is fine for beginners on small board sizes. WegoIgo is my current favorite, and the new version is a huge improvement that takes the program to a new level. 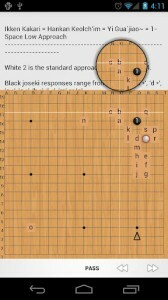 I originally got the program because it loads Kogo’s Joseki Dictionary, the only program on Android that does so successfully. I didn’t use it for anything else though, as it was hampered by a weird glowing stone effect that made it hard to see, and it was not very useful for recording games or doing problems. A few months ago, updates started coming from the developer Daniel Leong. The new version seamlessly integrates a floating circle with a detail of the area you are playing in. As you drag, the circle floats above your finger, and you can move your stone wherever you want to. As a plus, the stone actually goes directly under your finger, making placement both easy and accurate. The merit of this system is that it only takes one touch (with or without a drag) to place a stone. After recording with Gobandroid for months, I found I was happier with one touch recording, and could record both faster and more accurately with WegoIgo. Unfortunately, it didn’t offer the feature for mis-recorded stones, When I e-mailed Leong about that, he added the feature almost immediately. He also changed the graphics on the program when I told him the background was distracting, and has been great about any suggestions users have made. 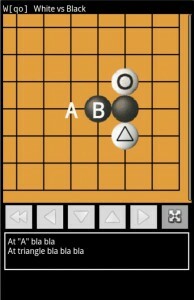 WegoIgo also loads problems and professional games, cleanly and easily, and you can download the AI if you want to play against gnugo. It offers advanced SGF editing features to boot, and you can comment and mark games up for study. Although the free version includes all of the features, I upgraded to the paid version so I could get faster updates. Also, the price is ridiculously cheap ($2.49), and I think it is important to support people who are writing go apps (trust me, none of them are getting rich on them).